One of our favorite family adventures is visiting amusement parks. Cedar Point Amusement Park was recently named one of the 10 best Amusement Parks in America and for good reason. 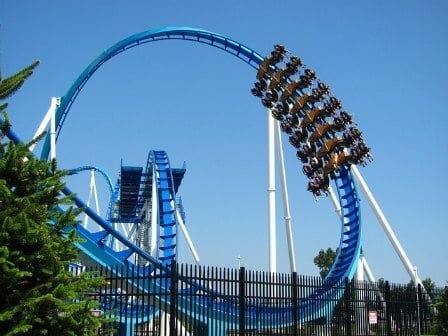 Long known to visitors as “America’s Roller Coast”, Cedar Point constantly pushes the limits and world records with its thrill rides, especially roller coasters. Our family lives an hour from Cedar Point so we love to plan day trips to Sandusky. 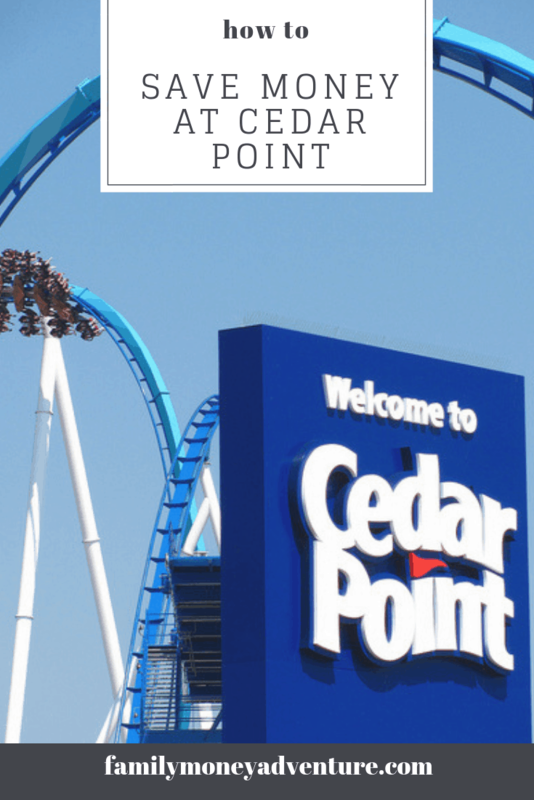 While there is so much to love about Cedar Point as a family, it often feels like we are spending a small fortune to visit, between tickets for 6 people, parking, and food. Over the years, we’ve discovered several ways to save money, find deals, and also maximize the money we do spend. Check out our tips to create the most enjoyable family visit without breaking the bank. Cedar Point ticket prices seem to rise every year. To spend less money on admission, don’t wait until you arrive at the park to buy your tickets. If you are purchasing tickets directly from Cedar Point, make sure to head to their website, where they often post deals for tickets throughout the summer. Quick Tip: If you are planning a trip to Cedar Point later in the summer, start watching Cedar Point’s website and social media for their Christmas in July ticket sale to score deeply discounted tickets. Cedar Point does offer a large picnic area just outside the front gate. Pack a cooler, leave it in your car, and take a break sometime during your visit to go out and eat. You will save tons of money with this one tip alone. The one con is that packing your own lunch requires walking back out of the park, retrieving your cooler from your car, walking to the picnic area, returning your cooler after you are done, and then re-entering the park. That can take up precious ride time depending on where you parked. Another way to make this more efficient is to plan your day so you end up towards the front of the park around the time you want to eat. You could also send one lucky adult (Me) out to the car early to retrieve the cooler and meet everyone in the picnic area. If you decide you don’t want to mess with packing a picnic lunch, you can save money at Cedar Point through their meal plans. 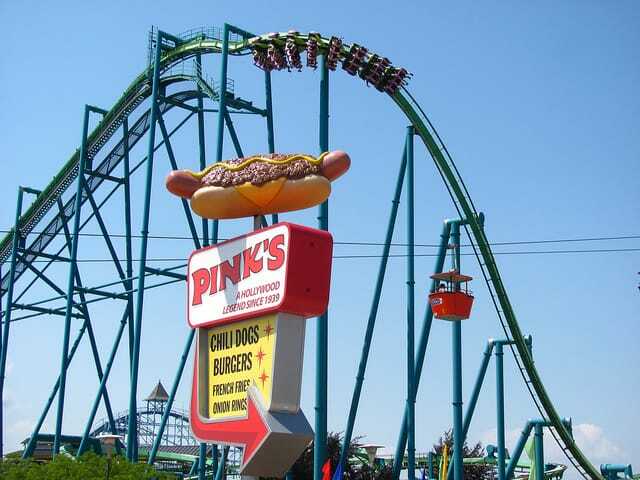 Cedar Point offers single meal plans as well as all-day dining plans. With the all-day dining plan, you can get an entree and a side at participating restaurants all day, with only a 90-minute wait between meals. Note: As a family that deals with food allergies, I appreciate Cedar Point’s detailed dietary needs guide on their website. Super helpful! Like most amusement parks, Cedar Point charges a parking fee. You can save $3 by purchasing your parking pass ahead of time online. There are no other parking options so why not save a few bucks with advance planning. Depending on your length of stay, size of your family, and your budget, staying on site may or may not be the best deal compared to other local hotels. Other hotels can offer amenities like complimentary breakfast that might be more appealing. That will be something for you to research to determine the best deal for your family. With all of the walking you will be doing at Cedar Point, especially on hot summer days, it’s important to stay hydrated. Their food guidelines allow you to bring in individual, unopened water bottles, which is great. If you need more than that, though. I suggest purchasing one of Cedar Point’s drink deals. You can purchase a souvenir bottle and get free refills all day on your first visit and then $1 refills any other visit during the season. The other option is a drink wristband which gives you free refills in a disposable cup during your visit. Although this tip doesn’t save you any money, it will maximize your time while at Cedar Point. Most people come to the park with no plan. Some people plan out every second of their day. I fall somewhere in the middle on the subject. For the money you are spending, you want to make the most of your trip, but you also want to enjoy yourself without pressure to fit everything in and stick to a schedule. It’s important to spend time before your trip deciding what rides & attractions are most important to ride and what your family can skip. What rides do you want to ride first? Where do you want to eat? Another tip to save time and avoid crowds is to pick alternative times. Eat an early lunch or dinner and catch shorter ride lines while everyone else is eating. If you need a break from the heat, take in one of Cedar Point’s many shows in air-conditioned theaters. In the end, it’s your family’s day in the park and you should plan to see and do everything you want to do during your time at Cedar Point. Cedar Point honors members of the military by providing discounted tickets and parking for all active, retired, and honorably discharged members of our armed forces. You will need to bring proper ID in order to validate the discount. Up to six tickets may be purchased at the discounted rate per military member. Cedar Point offers a super helpful Mobile App (available on iOS). The main feature is ride wait times, which will help you plan out your day and maximize your time throughout your visit. Other features include a park map, special money-saving offers within the park for app users, and a handy car finder to help you remember where you parked. If you are thinking about visiting Cedar Point for more than one day or multiple times during the same season, like into their multiple day ticket options. Often you can get your second day for $20 or less with these options. They even have ticket options that offer one day at Cedar Point and one day at their sister park, Kings Island, located just outside Cincinnati, Ohio. When planning a family trip to Cedar Point, it’s easy to be overwhelmed by all of the costs involved. With advanced planning and maximizing your time in the park, your family will enjoy one of the best amusement parks in the country without the financial stress. Do you have tips & tricks to saving money at amusement parks? Let us know in the comments below! Thanks for the tip on the cups! We have one person in the family who doesn’t ride bigger rides so they hold all our junk when we ride. We have never had a problem leaving our souvenir cups on top of the lockers and returning to get them when done riding. We do label them so they are easily identifiable as ours. We try to take very little in otherwise so that everything fits in a fanny pack or waist belt. Also the barbecue meal near the back of the park was a great value food wise. Thanks for the info! I do like the BBQ there.